There may be no more iconic American brand than Harley-Davidson. But like many storied companies, Harley has had to evolve to stay on top and at times its very existence has been threatened. Practically extinct in the mid-1980's, the company began a miraculous turnaround centered on a product development and manufacturing revolution. With dramatic improvements in efficiency and bottom-line results, Harley returned to dominance. 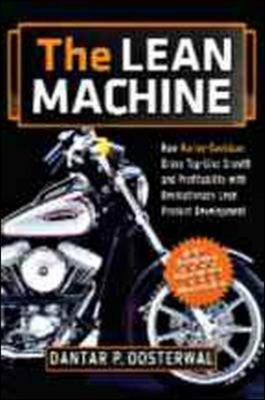 At the core of this incredible story was author Dantar Oosterwal, who brings the transformation of Harley-Davidson to life in "The Lean Machine". Filled with crucial lessons for any product development environment, it's also a great American success story. Dantar P. Oosterwal has led global innovation improvements as Vice President of Innovation at Sara Lee, as well as Director of Product Development at Harley-Davidson.